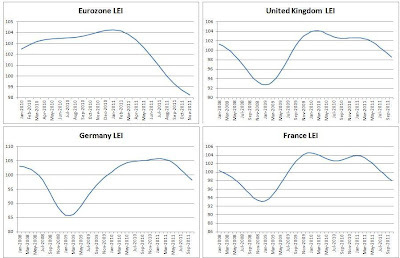 The series of business tracking continues with observing the development of the cycle in the eurozone and in the UK. The analysis will constrain itself only on observing the leading indicators from the OECD database and the Conference Board. 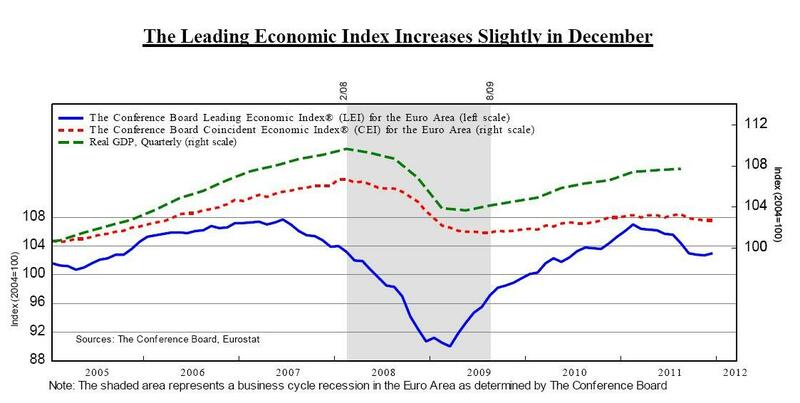 The first is the leading indicator for eurozone from the Conference Board. They compare the LEI with a coincident economic index and the quarterly RGDP growth rate. What can be noticed is a small increase of the index in December 2011 (which is the last available data), offering a slightly better perspective for the eurozone after the latest fiscal treaty conference in December and signs of reforms in Italy and Spain. However, it is still ambigous to conclude whether the index itself will show a rising signal for the rest of the year, or whether the bottom of the possible 'double dip' has been reached. 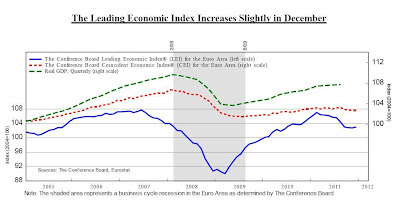 The index comprises of the following indicators: Economic sentiment index, Index for residential building permits, Index of capital goods new orders, Euro Stoxx index, Money supply (M2), Interest rates spread, Manufacturing purchasing index and the Service sector future business activity expectations index. To see more and to see the technical details, visit their website. You may notice that apart from the service sector expectations index and the interest rates spread, all of these indicators were observed and analyzed separately in the previous business cycle tracking post on the US. By observing each of them we could infer on which indicator could be driving the LEI upwards or downwards. But what is essentially important is the final signal received by the market that comprises the index. Upon observing this signal we may draw inferences on future economic activity. This is why the analysis for Europe will focus only on the end product, i.e. the LEI itself. OECD offers an opportunity to look at the indicators for individual eurozone countries and compare the recovery for each of them. the rest of the countries include a longer series from January 2008. Comparing across countries it is obvious that almost all of the selected countries are sending negative signals of future economic activity. Note that the last available data is for November 2011, meaning they didn't account for any of the new developments in December which could have, if included, corrected the indicators slightly upwards (as was shown in the previous graph from the Conference Board). The data from November, during the biggest uncertainty in Europe over the faith of the eurozone (which was covered in detail on the blog), clearly show that the situation was going from bad to worse. However, recent developments in Italy and Greece in January (not accounted in either of the indicators) could result in a much better future signals for the eurozone (and consequently(!?) 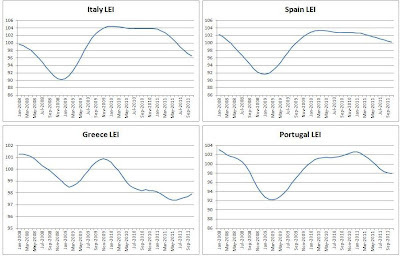 higher levels of the LEI index). But then, is the leading indicator really that good at predicting recoveries? Is it 'leading' at all? Its values for the final quarter of 2011 were clearly influenced by the huge level of rising uncertainty after the summer months and the shock following the US rating downgrade, which translated itself through stock and bond markets onto peripheral eurzone, once again emphasizing its instabilities. 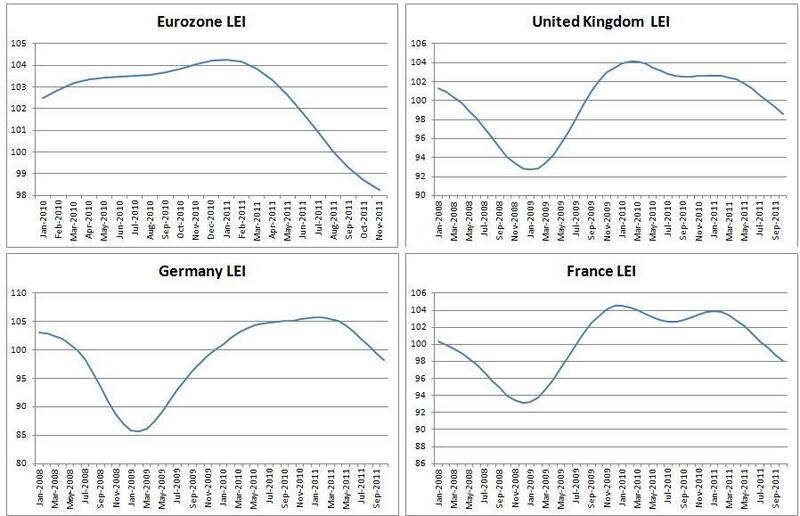 The value of the LEI at the time was pointing out to a possibility of a euro break-up and various other adverse effects, meaning that its sudden decreases in the last two quarters should hardly come as a surprise to anyone. However, when there is lack of confidence and huge uncertainty, political decisions will act as better signals on the market, as they will send signs of increasing or decreasing confidence which will influence business decisions on whether to order more goods, build more houses, pile up on inventories or anticipate a break-up of the whole currency. When they were anticipating this break-up and when they were disappointed in political abilities to provide a favourable solution, the outlook was grim and investment was low, implying decreasing values for all the observed leading variables. In the mean time the politicians didn't come up with a particularly good solution (the Treaty), but they could have nevertheless restored some confidence to investors. 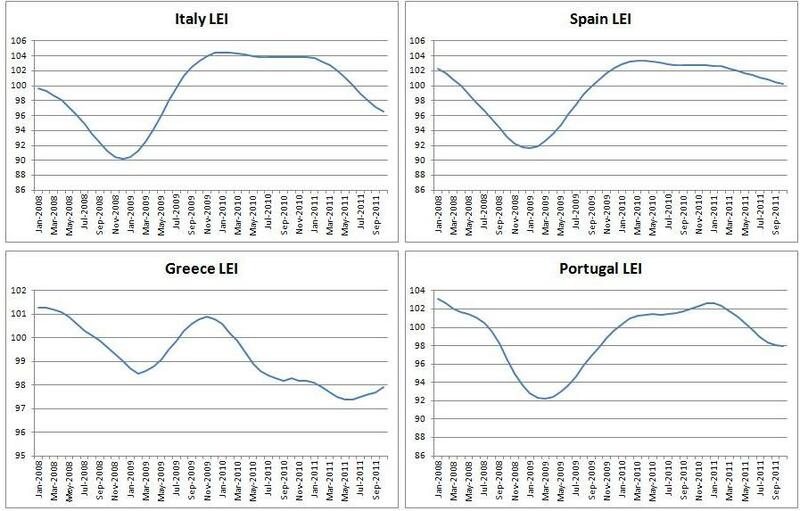 Also, the reformist governments of Italy, Spain and Greece (although a lot of uncertainty still arises here, meaning that it isn't likely to expect the Greek LEI to recover for the next quarter), will set the eurozone LEI on higher levels. So, in a crisis of confidence, policy uncertainty and political decisions are proven to have a huge impact on all variables, including the ones who are supposed to be signaling future trends in the economy. Therefore, it would be better simply to observe political solutions and immediate market reactions than the LEI to form expectations of upcoming economic activity. However, I refuse to be discouraged and will continue to observe both. so you're saying the LEI and other, similar leading indicators are useless in a crisis of confidence to predict a recovery? than what's the point of using any of these? do investors even care about leading indicators when making decisions? what about businesses or consumers? I wouldn't go so far to call them useless. They can serve as good indicators in certain occasions and they do present a decent picture of economic activity. Just look at the last post on US business cycle tracking. However, an investor or a business owner making decisions on future investment or production isn't likely to look at the LEI to determine the economic climate - they use other indicators and information on stock markets or bond markets. But the outcomes of their decisions should be captured in a LEI index, making it a good proxy of upcoming economic activity for economists. UK recovery policy – Austerity! What austerity?